Pyongyang, January 1 (KCNA) -- Respected Supreme Leader Kim Jong Un made a New Year address for 2017. In his address he sent New Year greetings to all Koreans and the progressive people of the world. 2016 was a year of revolutionary and auspicious event and great turn to be specially recorded in the history of the Workers' Party of Korea and the country, he said, referring to the achievements made last year. Last year the Seventh Congress of the WPK was held significantly with splendor as a grand political festival thanks to the high revolutionary enthusiasm of all the party members, service personnel and people and amid deep concern of the world. The Seventh Congress proudly reviewed the glorious history of the struggle of the WPK, which had led the revolutionary cause of Juche to victory under the wise guidance of President Kim Il Sung and leader Kim Jong Il, and unfolded a grand blueprint for accomplishing the socialist cause under the banner of Kimilsungism-Kimjongilism. An epoch-making turn was made in bolstering up the national defence capacity of Juche Korea and the DPRK soared as a nuclear and military power in the East that no formidable enemy dare encroach upon. The proud victory was achieved in the 70-day and 200-day campaigns to glorify the Seventh Congress of the Party. Thanks to the heroic struggle of the Kim Il Sung-Kim Jong Il working class and all other people, the gigantic goals of the 70-day and 200-day campaigns put forward by the WPK were successfully hit and a new breakthrough made in the country's economic development. The new spirit of era for building a powerful socialist country was created and trust in the Party and faith in socialism were more deeply cherished in the hearts of the people during the 70-day and 200-day campaigns. Kim Jong Un underscored the need to achieve the drastic advance in implementing the decision of the Seventh Congress of the Party this year. We should concentrate all efforts on the implementation of the five-year strategy for national economic development. This year's fighting goals should be hit without fail to open a bright prospect for the five-year strategy and put the overall economy of the country on a higher stage while consolidating the victory gained last year. "Let us accelerate the victorious advance of socialism with the great spirit of self-reliance and self-development as the dynamic force! ", this is a militant slogan we should uphold in the New Year's onward march. It is necessary to actively wage the all-people charge for attaining the goal of five-year strategy by dint of the self-reliance and self-development. In the field of science and technology it is imperative to solve scientific and technological problems arising in updating industrial establishments and putting the production on a normal footing there with a main emphasis on the local production of raw materials, fuel and equipment. Electricity, metal and chemical industrial fields should take the lead. In the coal industry and railway transport fields, a priority should be given to meeting the need for coal and its transport to power plants and metal and chemical factories. It is important to quickly develop the machine industry. A radical turn should be effected in light industry, agriculture and fisheries and thus a greater progress be made in improving the standard of people's living. In the construction field, Ryomyong Street should be completed on the highest level and efforts be focused on the construction of important projects, and more educational and cultural facilities and dwelling houses be built wonderfully. All sectors and units of the national economy should wage a vigorous drive to produce and economize as much as possible under the slogan of self-reliance and self-sufficiency and thus fulfill this year's plan on all indices. The whole country should turn out for the land management. On all fronts of culture including education, public health, sports and literature and arts, a fresh revolutionary surge should be brought to step up the building of a highly civilized nation. The political and military position of socialism should be further cemented as an invincible fortress. All the service personnel and people should share their thinking and breath with the Party and rally around it in thinking and purpose, morality and sense of obligation and work hard for the prosperity of the country. We should resolutely smash the enemies' despicable and vicious moves to dampen the pure and ardent desire of the people for the Party and estrange the people from it. It is also important to bring about a great surge in bolstering up the military capabilities. Victory or defeat in this year's drive for implementing the decision made at the 7th Congress of the Workers' Party Korea depends on the role to be played by the party organizations and working people's organizations, Kim Jong Un said, stressing the need for all the primary party organizations to embody the basic spirit of the First Conference of Chairpersons of the Party Primary Committees and make sure that the spirit of uninterrupted innovation and advance is fully displayed in the all-out charge this year. 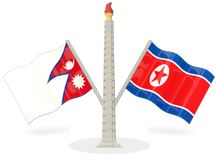 Kim Jong Un also called on the entire nation to pave a wide avenue to independent reunification by the united efforts. It is necessary to take active measures to improve the north-south relations and defuse acute military conflict and danger of a war between the north and the south. All the Koreans in the north and the south and abroad should solidarize and get united on the principle of subordinating everything to national reunification, the cause common to the nation, and activate the reunification movement on a nationwide scale. It is needed to foil challenges of the anti-reunification forces at home and abroad going against the nation's desire for reunification. Kim Jong Un said that unless the U.S. and its vassal forces stop nuclear threat and blackmail and unless they stop the war exercises which they stage right at our noses under the pretext of annual exercises, the DPRK would keep increasing the military capabilities for self-defence and preemptive striking capacity with a main emphasis on nuclear force. The DPRK will defend the peace and security of the country with its force and make active contribution to defending the world peace and stability, he stressed. The WPK and the government of the DPRK will remain loyal to the ideas of foreign policy -- independence, peace and friendship --and make joint efforts to expand the good-neighborly friendship and cooperation with countries advocating independence and realize the genuine international justice. Kim Jong Un said that he would make devoted efforts to make sure that the days when our people sang the song "We Are the Happiest in the World" full of optimism about the future with deep trust in President Kim Il Sung and leader Kim Jong Il only will become a reality today, not just a past days of history, and solemnly pledged to become a faithful servant serving the people with pure and sincere dedication.